If breaking your arm wasn’t bad enough, you have to deal with the smell, irritation, and restriction of a cast for six to twelve weeks. While fiberglass and plaster braces have a long history of success, a company in Minnesota believes it has a better option. The Exos braces and casts (from Exos Medical) are made from polymer and foam and take only 8 minutes to apply. Shaped in a dry heat process, the Exos material can be readjusted, tightened, or removed easily. They are also completely waterproof. Exos is a great example how new materials and designs can upgrade old technology. New braces and casts from Exos are waterproof and really colorful. Not all advances in medical science are going to involve stem cells, nanotechnology, or robots. There’s still much room for growth using new applications of traditional materials in smarter ways. The exponential improvement in quality of life promised by advancing discoveries in science won’t come about through any one technology. Instead it’s going to take many smaller technologies leap frogging and stop-gapping each other to get us into the next generation of medical success and human longevity. Exos braces are formed by layers of polymer and foam. Laminating layers of materials together often produces a substance that has higher strengths to weight ratios. We saw a similar approach in the construction of the DASH robot. The exo material has the same strength as plaster or fiberglass but with 25-50% less mass. 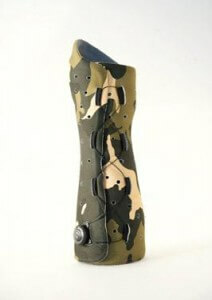 This provides less strain on the patient as they go about their daily activities with a cast. The small dial on the bottom of the cast allows it to be adjusted by doctor or patient. One of the major selling points for Exos is that their products are shaped using a dry heat system. This eliminates the mess and may reduce the chance for bacterial growth and infection that can occur during traditional cast fitting. It also means that the same cast can be removed, reheated, and reshaped as necessary during the healing process. There’s no shears or cast saw needed. The casts are also more translucent to x-rays so that doctors can save time by not removing them. Exos material is supposed to save doctors (and patients) a significant amount of money in labor costs, but medical facilities will need a special Exos oven to heat the materials correctly. There’s a good chance that the new technology will have about the same total expense as the old. So why use Exos? Well, first the braces come in a lot of crazy colors and look much cooler. But for those of you who don’t buy your medical supplies based on appearance, Exos also offers increased comfort and the ability to bathe. The foam/polymer laminate is completely waterproof, allowing for photo-opportunities like swimming in an Olympic-sized pool. Of course, the average user will be more pleased with the ability to wash worry-free using soap and water. A small adjustable dial on the cast or brace also allows patients to adjust the tightness of the cast giving easy access for scratching or compensation for extra space due to muscle atrophy. Hopefully I’ll never have to use an Exos product, but I’m certainly impressed with the options it provides. Many small improvements in medical technology like this one add up to some impressive trends in healthcare. If you’ve used an Exos cast or brace (they’ve only been around since 2007, so I know that won’t be many of you) tell us about your experience in the comment section below.